MdCV officers, new and retiring, front from left, Chloe Volkman, Alaina Marsh, State FFA Sentinel Garrett Craig, Kaelin Criqui, Kathryn Vaught, back, Danny Rice, MdCV FFA advisor, Bayleigh Lacey, Sadie McGowin, Koby Vanderpool, Wyatt Lingenfelter, and Frank Warner. MdCV FFA photo. 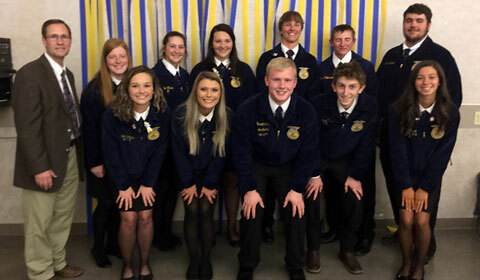 The annual Marias des Cygnes Valley FFA Chapter Banquet was held on Friday April 11, 2019. Approximately 100 people, including members, families, and friends, gathered in the Melvern Community Center for pork chops and a potluck meal, awards and the installation of the 2019-2020 chapter officers. An invocation from Frank Warner was followed by the dinner consisting of pork chops, sponsored by Don and Janise Hook, and side dishes and desserts brought by our members and their families. Following the dinner and chapter scrapbook video produced by Kathryn Vaught, the chapter officers president Chloe Volkman, vice-president Brookelyn Janssen, secretary Kathryn Vaught, treasurer Bayleigh Lacey, reporter Frank Warner, sentinel Alaina Marsh, and advisor and KSU student intern Cassandra Ebert began with opening ceremonies. KobyVanderpool, chapter student-council representative, introduced special guest speaker Garrett Craig, Kansas FFA Sentinel, with his speech “Focusing and Committing to Your Talents and Passion”. Other guests included members of the USD 456 Board of Education, Marais des Cygnes Valley High School Principal Ben Gordon, members of the MdCV Ag Education Advisory Board, Joe and Shirley Litchtenauer, Dale and Peggy McCurdy, Jeff and Merrilyn Casten, Jennifer and Peter Roy, Janae and Caleb McNally, Jarah and Mike Hauger, and Joe and Shirley Lichtenauer. 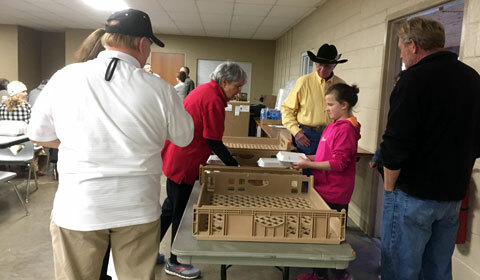 A young chef carefully turns in her entry for Kids-Q to KCBS reps, from left, Dave and Peg Rogers, Linda and Dennis Polson, Mark Collier, and not pictured, Kim Collier, as local judges wait in anticipation. Jan Williams photo. It’s a part of Smoke in the Spring that most folks don’t know is going on Friday evening, but you can bet there are some young cooks that have a watchful eye on their smokers for about three hours while everyone else is out enjoying the community barbecue party. In the annual Kids-Q Competition, kid chefs compete in two age divisions, 10 and younger, and 11 and older. The cooks must be sponsored by one of the competition teams and cook their entries on site. At the cook’s meeting, the cooks are each given one pound of ground beef, donated this year by Allen Meat Processing, Allen, Kan., to cook however they choose. Others who make Kids-Q possible are 24 local celebrity judges, who are instructed on the Kansas City Barbeque Society judging process before the kids’ turn-in time of 8 p.m. The kids contest is not a KCBS sanctioned part of Smoke in the Spring, but it is conducted according to KCBS rules and scoring. Judges are sequestered in the community building during the judging process. At turn-in, the chefs bring their samples to the turn-in window at the community building, where the judging is conducted. The samples go to one of four tables of six judges each, where they are scored according to appearance, taste, and texture or tenderness. The judging process is the same as the sanctioned contest the next day. 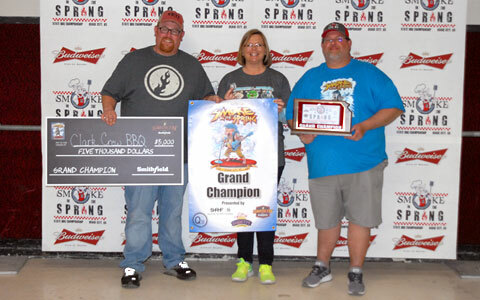 Clark Crew squeezed out last year’s grand champs, Hogline BBQ, Dustin and Mary Reese, of Owatonna, Minn., who claimed reserve grand champion this year. Coming in third overall was Hunka Hunka Burnin’ Rub, Chris Hoisington, of Olathe, Kan.
LYNDON – The Lyndon USD 421 Board of Education filled the district’s opening for a new superintendent on Friday, but created a vacancy at the high school at the same time. 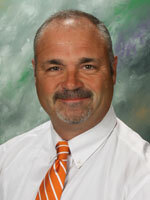 The board announced today that it hired Lyndon High School Principal Brad Marcotte as superintendent of the district. Marcotte will replace USD 421 Superintendent Charles Coblenz, who is retiring at the end of this school year. The board began its search for a new superintendent after Coblentz announced his retirement plans. The board made its decision at a special meeting April 5, 2019, after interviewing four candidates during special meetings last week. Coblentz has worked the Lyndon district for two years; he had previously served as superintendent in Easton, Kan., since 2006. Upon retirement, he will have been 44 years as an educator. He said he was looking forward to spending more time with his family and toward new opportunities outside the field of education. Marcotte has been LHS principal since 2005, after he had earned a master’s degree in building leadership at Emporia State University in 2004. He was a graduate of Northern Heights High School and received a bachelor’s degree from ESU. He began his teaching career at North Lyon County as a middle school and high school science teacher, and spent one year at Washburn Rural Middle School. He recently earned endorsement to serve in a district level position. His duties as superintendent begin on July 1, 2019. Marcotte and his wife, Erin, have three children, Brayden, eighth grade, Reanna, sixth grade, and James, fifth grade. In his free time, he enjoys spending time with his family, and gardening. TOPEKA – Brad Loveless was confirmed by the Senate as Secretary of the Kansas Department of Wildlife, Parks and Tourism, April 5, 2019. Gov. Laura Kelly appointed him in January. Loveless joined the department after a 34-year career with Westar Energy, where he was most recently the senior director of environmental conservation and sustainability. Prior to that position, he was director of biology and conservation programs and earlier held environmental management positions at Wolf Creek Nuclear Operating Corporation. He also served as a leader of Westar’s Green Team, an active volunteer group of employees and retirees that helps with habitat improvement, environmental access and education, and enhancement of sensitive species. A fisheries biologist by training, he is an avid angler, hunter and beekeeper. Kaelin Criqui and Frank Warner explain to the students prescribed burning and equipment used at the Melvern Fire Department to help control rangeland burns. Photo thanks to Danny Rice. 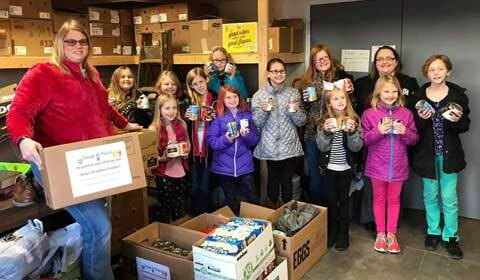 The Marais des Cygnes Valley FFA Chapter helped celebrate National Agriculture Month by hosting an agriculture awareness day for the USD 456 third through fifth graders. The event was Thursday March 21, 2019, at the Melvern fairgrounds. 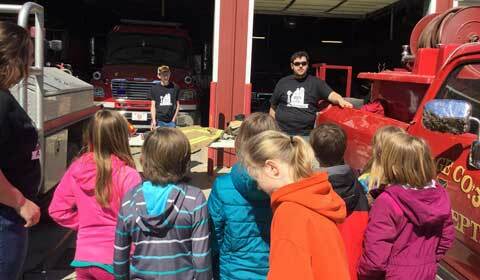 More than 60 elementary students and teachers were educated on agricultural related topics including ag machinery, beef, dairy products, wildlife management, wheat, corn, drones, small animal care, horses, and prescribed burning control. Twenty-seven MdCV FFA chapter members, along with Danny Rice, adviser, and Ms. Ebert, KSU student intern, took part in the presentation of the 10 rotational workshops. The day concluded with refreshments and drinks. Melvern Jr. Highline 4-H Club members gather at the Melvern City Park after a recent club meeting, front from left, Amelia Arb, Gradey McNally, Levi Arb, Gentry McNally, Ellie Sowers, back, Allie Reeser, Braelyn McNally, Justin Brinkley, Natalie Green, Aubrie Edington, Chelsea Green, and Tara Green. 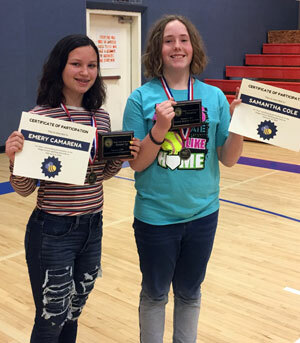 The March meeting of the Melvern Jr. Highline 4-H Club was held March 17, 2019, at the Melvern Community Center, and was called to order at 5 p.m. by President Tara Green. The club began their meeting with The Pledge of Allegiance and the 4-H Pledge led by Amelia Arb. Secretary Allie Reeser called roll; members and parents answered with their favorite drink; there were 11 members and six adults present. Allie then read the minutes from the last meeting; they were approved as read. Treasurer Ellie Sowers read the treasurer’s report; it was approved as read. Reporter Bella Reeser stated she had submitted three articles to the newspaper since the last meeting. Historian Amelia Arb read an article to the club. Justin Brinkley gave a report from the council meeting, stating the 4H Insurance Policy. In leaders report, leader Caleb McNally congratulated members in their hard work at district and regional club days. He also reminded members that 4-H camp enrollment would begin April 1. 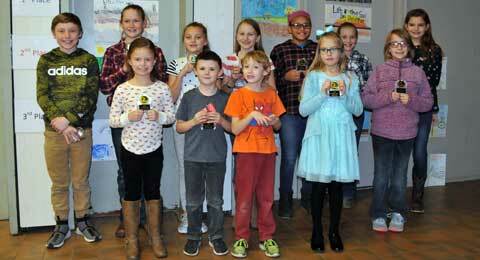 In new business, members were reminded the Melvern Easter Egg Hunt would be coming up. 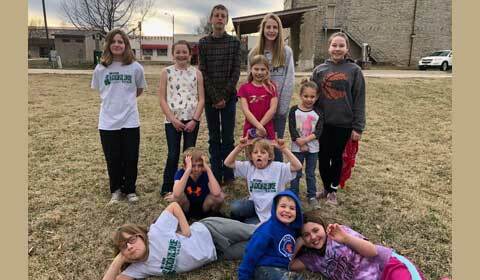 Amelia Arb made a motion, which was seconded, that the Melvern Jr. Highline 4-H Club would host the Melvern Easter Egg Hunt at 1 p.m. April 21, at Melvern City Park. In 1885, Osage County elected its first candidate of African descent to a county office. Quintus M. Hutcherson was born into slavery in Tennessee in 1850. He was a newcomer to the county, having escaped the deteriorating conditions in the south after the end of post-Civil War Reconstruction, the time during which political and social transformation of the southern states was being overseen the newly rejoined federal government. Reconstruction concluded with the Compromise of 1877, which removed federal troops from the south and allowed any gains made during Reconstruction to be undone, particularly leading to deteriorating conditions for those of African descent. The outspoken, and Republican, Dr. Hutcherson eventually made many enemies in his hometown of Clarksville, Tennessee, and finding that residence there was neither safe nor pleasant, moved his family west. Quintus and his wife settled in Melvern, Kansas, the only family of color at that time in town. While he settled in the area and took up farming, Quintus had been trained as a doctor. 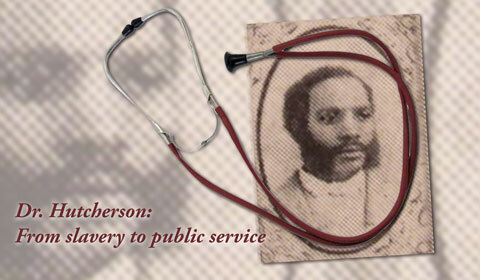 Formal training for African Americans at this time could only be obtained at certain medical universities. Eclectic physicians, a persuasion similar to modern day chiropractors, however, did not necessarily require formal schooling. It is uncertain which category Quintus’s medical experience was in, but it was not requirement for the public office. It would assist him, though, in besting his opposition. The Republicans knew the potential for a winning African-American candidate was there. In 1871, shortly after people of color were given the right to vote with the 15th Amendment, a much-esteemed man of African descent from Burlingame, Kansas, Moses Turner, had run for the office of county clerk and narrowly missing being elected. So when nominations for county offices were made, the party discarded their previous candidate and heartily threw their backing behind Dr. Hutcherson. The Frontier Extension District recently presented its annual appreciation awards to individuals who have made outstanding contributions to Extension programs in the district’s three counties. Honored were Wayne Wischropp, of Osage County, Dr. Larry and Janie Mages, Franklin County, and Ron and Christy Ratliff, Anderson County. Wischropp is a life-long resident of Osage County. As a youth he spent many hours with his father in livestock sale barns. His father was one of the owners of the Waverly sale barn for a number of years. During that time, Wayne watched, listened, and learned how to be an auctioneer. Also, as a youth, Wayne was in 4-H with cows being his primary project. Wayne started helping with the 4-H livestock sale at the Osage County Fair in Osage City during his early years in college. After college he then became the auctioneer for the sale and has been doing it ever since. He auctioned the 4-H livestock sale at the Overbrook Osage County Fair for about 10 years and the Lyon County fair for about 12 years. Besides his long term commitment auctioning for the 4-H sales, he managed the 4-H sale in Osage City for about 10 years, and has served on the Osage County Fair Association Board. In addition, he supported his daughter while she was in 4-H. Wayne has 50 plus years of continuous service to the area 4-H youth. 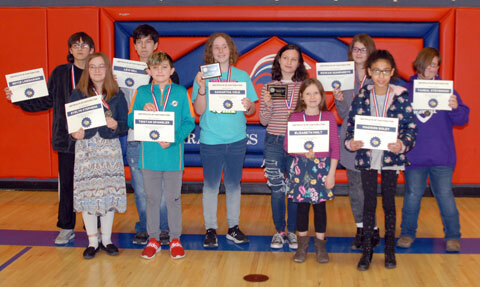 Winners of the Osage County Conservation District’s poster, essay and limerick contest were honored guests at the district’s annual meeting Jan. 28, 2019, when they received their awards. 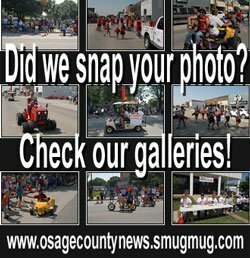 Each year the Osage County Conservation District sponsors a poster, essay and limerick contest, with a different theme each year determined by the National Association of Conservation Districts. This year’s theme was “Life in the Soil: Dig Deeper”. Information about the competition is given to the schools in late October, with entries due before Christmas break. A total of 350 entries were received. There were no essays submitted this year. Jace Balding: Young farmer of the year. 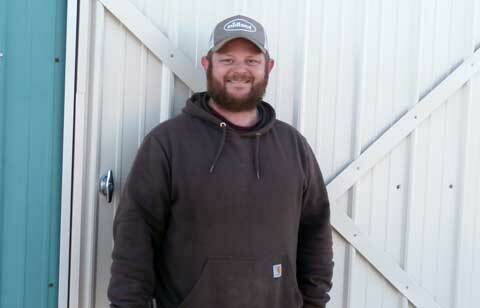 This year’s Osage County Young Farmer awardee is Jace Balding, of rural Osage City. Balding grew up near Reading with his brother and two sisters. He got an early start with farming and ranching, with his father doing custom cattle work and managing grassland. His grandfather had some row crop land that Jace also helped with. The first job on the farm Balding remembers doing is feeding cattle. “I have fed a lot of cattle!” he said. Balding also ran the swather and rake as a kid. His dad did all the baling, though. Once, when he was 10 years old, he was allowed to run the combine. “It was a lot of fun until my mom found out,” Balding said. Balding was active in 4-H as a kid. The goal of 4-H is to develop citizenship, leadership, responsibility and life skills through hands on learning projects. Balding’s family had a sheep herd and bottle calves, and learned many life skills by caring for and showing these animals. In 1999, when he was in high school, he went to work for Ron and Pat Fredrickson on the weekends and during the summer. In 2005, he earned his associate degree from Butler Community College in farm and ranch management. He went to work for the Fredricksons full time after his graduation. The Fredricksons were awarded the 1999 Banker Soil Conservation Award, 2010 Grassland Award, and the 2012 Banker Water Quality Award. Balding helped with a lot of the work that allowed them to receive those awards. 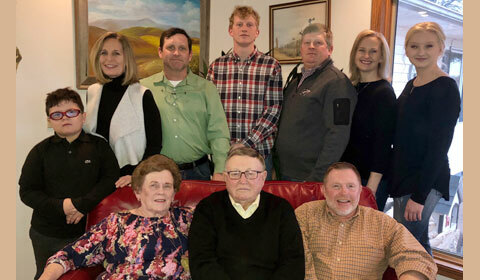 The Pearson family: 2018 Kansas Bankers Award winners for Osage County. Pearson Farms has been selected as the winner of the 2018 Kansas Bankers Association’s Soil Conservation Award, which recognizes farmers and ranchers that have improved their land through conservation practices that conserve their soil. This year’s winners are Fred and Pat Pearson and their family, of Osage City. The family includes son Clark and his wife, Bobbi, and Max, their son; son Jim and his wife, Dawn, and their children, Paige and Peyton; and son Jeff, who is not involved in the farming operation. The Pearson family has farmed in the Osage City area for more than 145 years. 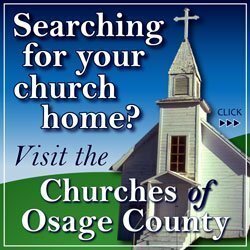 Fred’s great-grandfather settled northwest of Osage City in 1874. His first job after immigrating from Sweden was working in the coal mines, and soon afterwards he started farming. Paige, a senior at Kansas State University, and brother Peyton, a college freshman, plan to be the sixth generation of Pearsons to farm in Osage County. Fred was born and raised on a farm near Miller. He attended Kansas State University from 1959 to 1963, where he studied ag education. He met Pat during college. Pat grew up on a farm near Manhattan. “My father wanted someone in the family to farm, and he was pleased to find out that Fred and I planned to marry,” Pat said. Fred and Pat were married in 1963. From 1963 to 1968, Fred taught vocational agriculture at Burlingame, and Pat taught grade school at Osage City. Pat retired from teaching to take care of her grandchildren and help as needed around the farm. The first ground Fred and Pat bought was in 1966. The land was very poor and needed a lot of conservation work and trees and brush controlled. In 1966, Fred and his father, Earl, started the Miller Elevator. The elevator has grown over time and they currently have three locations, Miller, Hartford and Neosho Rapids. The young couple purchased 240 acres and moved to their current home in 1969. The Pearson Family farm consists of crop farming, mainly corn, soybeans and wheat, the elevator business, and cattle, mainly stockers, and also a cowherd. All this takes coordination of effort and the family divides the work to get the job done. Jim and a hired man plant crops, run the combine, bale the hay, care for the cattle and repair fences. Clark works the elevator, keeps up on crop variety selections, herbicide and insecticide use, and does most of the crop scouting. Bobbi and Dawn have off the farm jobs to help supplement the family income. They both grew up on good family farms, understand farm life, and are a great help around the farm. Fred started slowing down in 2014 and now helps where needed. TOPEKA, Kan. – Gov. 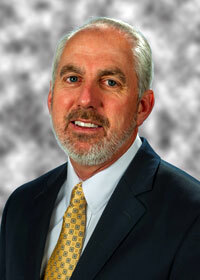 Laura Kelly has named Brad Loveless to be secretary of the Kansas Department of Wildlife, Parks and Tourism. His appointment was effective Jan. 14, 2019. Loveless is familiar to many Kansans and to KDWPT staff as a leader in conservation and environmental programs. He comes to the department from a 34-year career with Westar Energy where he was most recently the senior director of environmental conservation and sustainability. Prior to that position, he was director of biology and conservation programs and earlier held environmental management positions at Wolf Creek Nuclear Operating Corporation. He is perhaps most well-known as one of the leaders of Westar’s Green Team, an active volunteer group of employees and retirees that has been helping with habitat improvement, environmental access and education, and enhancement of sensitive species for 30 years. 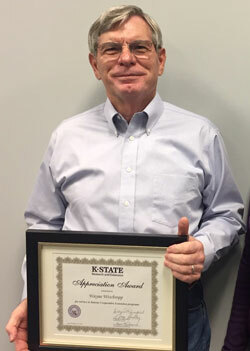 In 2013, Loveless was awarded the Kansas State Forester’s Award for Community Forestry. In 2009, he was recognized by the Kansas Wildlife Federation as Wildlife Conservationist of the Year and by the Kansas Association for Conservation and Environmental Education as their Strickler Award winner for Environmental Education. He is an avid hunter, angler and beekeeper. Osage County had a crime problem. It was the summer of 1883, and hardly a town in the county was untouched by some sort of criminal activity. The economic and population boom brought by the railroads and the coal mines had also brought a surge of individuals looking to make a profit via unsavory means. Burglars, also known as “sneak thieves”, frequently broke into residences, and horse thieves were plentiful. Citizens were encouraged to protect themselves, which led to the formation of vigilance committees or posses to protect towns and retrieve stolen goods. Town streets at night were hazardous for pedestrians. The dark was cover for those who wanted to disappear into its shadow. People of questionable character would gather on both sides of the sidewalk, singing, whistling and swearing at passersby. Street walkers and prostitutes were common. Respectable women, in particular, were afraid to walk on the streets at night for fear of being harassed. Frequent lawbreakers became infamous in the county papers. Johnson, “The Pimp”, and his one woman employee wandered from town to town searching for clients, frequenting the streets and local establishments to the point of annoyance. He and others of the same profession would also take up residences at vacated properties for seclusion. When Pimp Johnson set up a tent along Salt Creek as his headquarters, a public outcry went out to push them into the creek, promising the support of the community for the people following through with disposing of the couple. Another character known as “The Kid” was a gentleman gambler that dressed in the highest style, from his matching clothes to his fine gloves. The Kid, like Pimp Johnson, would patronize the saloons and other establishments that allowed gambling. The Kid’s amiable nature gave him a certain leeway with the authorities, and when he and his friends were locked up, they would sing, dance and cause such a commotion that houses neighboring the jail would be kept awake until the wee hours of the night. While most of the county’s towns were affected by this crime wave and used their best attempts at law enforcement, Osage City’s law officer stood out as an example of the quintessential lawman of the time. 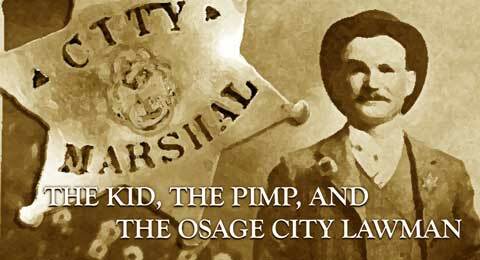 Marshal Jack Williams worked hard to control the undesirable element within the Osage City limits. Marshal Williams assumed the office of Osage City marshal in 1880. He was fair, just, and a strict enforcer of the law. Williams wasn’t frightened by angry mobs or other men of money and influence that tried to affect his pursuit of enforcing the law and keeping the peace. LYNDON, Kan. – The Osage County USDA Farm Service Agency has announced that Frances Burkett, of Osage City, Kan., was elected to represent her local administrative area during the recent county committee election. All recently elected county committee members will take office in January 2019 and will be joining the existing committee. Every FSA office is served to by a county committee made up of local farmers, ranchers and foresters who are elected by local producers. Nearly 7,800 FSA county committee members serve FSA offices nationwide. Each committee has three to 11 elected members, who serve three-year terms of office. County committee members impact the administration of FSA within a community by applying their knowledge and judgment to help FSA make important decisions on its commodity support programs, conservation programs, indemnity and disaster programs, emergency programs and eligibility. County committee members impact producers through their decision making and help shape the culture of a local FSA office. They also ensure the fair and equitable administration of FSA farm programs in their counties and are accountable to the Secretary of Agriculture. Members conduct hearings and reviews as requested by the state committee, ensure underserved farmers, ranchers and foresters are fairly represented, make recommendations to the state committee on existing programs, monitor changes in farm programs, and inform farmers of the purpose and provisions of FSA programs. They also assist with outreach and inform under served producers such as beginning farmers, ranchers and foresters, about FSA opportunities. 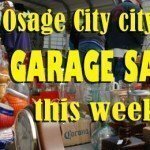 For more information, contact the Osage County FSA office at 785-828-4631. Lyndon Leaders 4-H Club members receive recognition at Achievement Night, from left, Breckyn Peterson, Leanne Shoup, Allie Kneisler, Gage Kilgore, Ethan Kneisler, Brynna Peterson, Paige Gebhardt, and Joyse Hutchcroft. Courtesy photo. 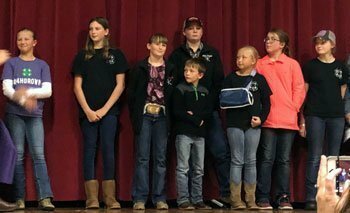 The Lyndon Leaders 4-H Club participated in the Osage County 4-H Achievement Night for the club’s meeting on Nov. 3, 2018, at Lyndon High School. Before the achievement night festivities, club officers were elected for the new 4-H year. New officers will be Savannah Davis, president; Allie Kneisler, vice president; Leanne Shoup, secretary; Ethan Kneisler, treasurer; and Breckyn Peterson, reporter. On Nov. 17, members met at the Topeka Walmart to help shop for the club’s adopt-a-family. At the December meeting, we will bring a gift for the gift exchange, bring Christmas desserts, and dress up in Christmas spirit clothes. In an era when a favorite pair of shoes was meant to last past the time when they lost their sole, the Royal Shoe Shop served the community of Lyndon. Previously owned by a Mr. Leslie L. Barnes, it was purchased in 1923 by Clyde Morand, a fresh graduate of the Kansas School for the Deaf. 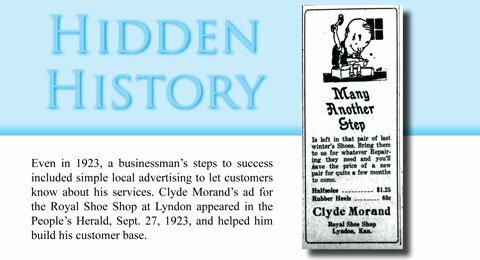 Clyde was the son of Elmer and Gertrude Morand, and was born in Kansas in 1903. Elmer hosted barn dances throughout the summer, entertaining the community with music and laughter. However, after a time, Elmer and Gertrude noticed that Clyde was not able to hear the joyous sounds and share in them. The Morands heard of Dr. William H. Cook, a recent immigrant to the area who specialized in eyes, ears, nose and throat, and drove to Beloit to see what could be done for their son. The family shortly thereafter moved south of Topeka, which undoubtedly offered more resources for their deaf son. In 1913, Clyde started attending the Kansas School for the Deaf, in Olathe. This boarding school had been created in 1866 and was the first of its kind in the state. In addition to teaching the students sign language and typical school subjects, they were also taught a trade that would help them after they graduated. Vocational training included baking, sewing, printmaking, and shoemaking – which is the trade that Clyde would learn. The shoemaking department was established early on in the school’s history, its lead teacher being Charles “C. H.” Hyer. Mr. Hyer moved to Olathe in 1872 and began teaching the students how to make and mend shoes. C. H. opened a cobbling shop on the side and was assisted by his brother Edward. In 1875, a cowboy stomped into Hyer’s boot shop complaining about his boots and petitioning Hyer to create a better boot. C. H. determined that the best style had a pointed toe, higher and sloped heel, and stitching up the leg. The style was a hit and propelled Hyer’s boots to a favorite among cowboys and those keeping the Wild West alive in film. Hyer’s prosperity in boot making did not sever his relationship with the school, however. Hyer boots continued to be involved in vocational education in the industrial department.